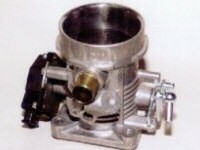 Not only do I specialise in carburetters, but also in throttle butterfly housings, which function in a similar way as carburetters. 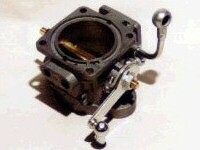 They can be bushed, new spindles fabricated, and standard or oversized butterfly valves produced. 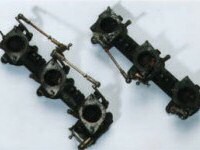 As with carbs, butterfly valves (throttle-discs) may stutter in the throat (when the spindles are badly worn) causing a small ridge. 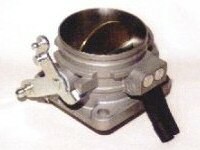 This prevents the valve closing properly resulting in a higher tickover. 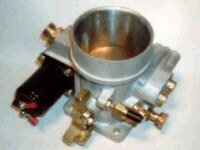 Oversize boring (greater air-flow) for race-use (ref air-valve body DB 190 - Ø57mm to Ø61mm) can also be catered for. This is limited, of course, by the body-casting diameter. 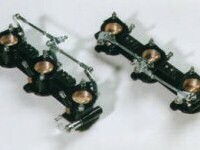 This mechanical work precedes tuning, either rolling-road or dynamometer, as with normal tuning procedure. 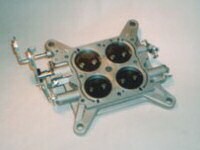 Any angle (bypass) can be set, to a tolerance of 0,015mm to compensate for heat expansion. Finally, bodies are tested on a flow-bench rig, to a maximum of 0,25 kg air/h in cold state.